Stainless steel as all other metals (except gold) rust. Bridge deck studies indicate that it will last longer than other types of steel reinforcement in the right environment. Once the corrosion cycle begins the corrosion cycle of steel rebar takes over and the concrete is eventually destroyed. 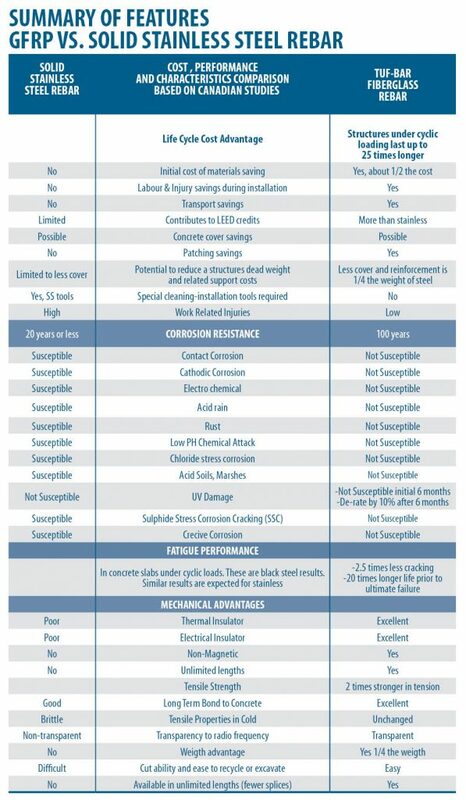 Stainless steel’s initial cost is much higher than fiberglass rebar or other types of steel reinforcement. GFRP’s initial cost is less, it will last longer and it will create less concrete damage and repair costs over time. 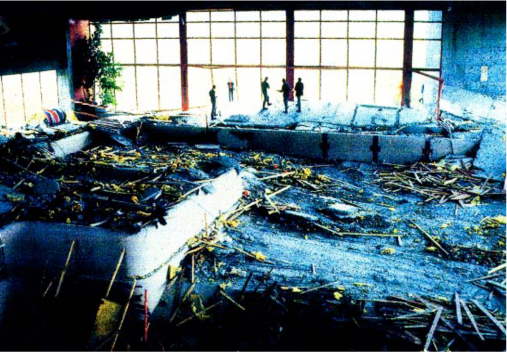 13 year old swimming pool in Switzerland collapsed after failure of stainless steel rods due to chloride induced corrosion. Fiberglass rebar and fasteners eliminate sulphide stress corrosion cracking and are ideal use for use in oil and gas applications. Stress corrosion cracking (SCC) is the cracking induced from the combined influence of tensile stress and a corrosive environment. The impact of SCC on a material usually falls between dry cracking and the fatigue threshold of that material. The required tensile stresses may be in the form of directly applied stresses or in the form of residual stresses (see an example of SCC on an aircraft component). Buried pipelines provide a good example of such complexity. The impact of such stress corrosion cracking is most commonly catastrophic as exampled by the historical failure of the UK Flixborough chemical reactor in 1974. Fiberglass rebar does not experience mechanical or corrosion fatigue in the same way as steel. When exposed to cyclic loads, no micro-cracking has been detected. Fiberglass rebar and fasteners are immune to crevice corrosion and have been used in floating dock and other applications where corrosion is an issue. Contact Corrosion and Galvanic Corrosion. Galvanic corrosion will occur if stainless steel bar comes into contact other types of steel. GFRP is an electrical insulator… without an electrical pathway between different types of steel no corrosion will occur. Carbon steel contamination has no effect on Fiberglass rebar. Stainless steel rebar tools are not required for installation. Fiberglass rebar eliminates potentially time consuming and health hazardous acid pickling solutions required to clean stainless steel rebar. Carbon rebar steel can only tolerate chloride levels of 0 – 0.4%. Stainless steel rebar can tolerate chloride levels up to 7%.